Stress happens, especially in education. A packed schedule, a new request from administrators, papers to grade, an accidentally missed appointment, spilled coffee . . . your head pounds, your shoulders tense, your eyelids droop. You feel stuck. How can you get a better handle on this? One valuable, often overlooked, and durable way to manage stress is to build positive habits, slowly and over time. Our brains are hard-wired to focus on the negative, but by practicing mindfulness, we can reprogram them — teach our brains to accentuate positive experiences and maintain serenity. 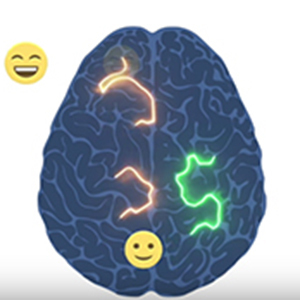 The human brain evolved with a “negativity bias,” says mindfulness expert Metta McGarvey, a lecturer at the Harvard Graduate School of Education. Negative events and thoughts have a proportionally greater impact on our memory and psychological state than positive ones do. From a survival standpoint, it makes sense — strong recollections of bad experiences means we’re more likely to learn from mistakes and avoid a life-threatening situation. This negativity bias also means that smaller, day-to-day stressors tend to take precedence in our thoughts, leaving less room for positive framing or constructive action planning. But it doesn’t have to stay that way. Our brains can change, physically, as a result of learning, says McGarvey. In a process called “experience dependent neuroplasticity,” neural connections grow based on what we’re learning. Repeating the same thoughts, feelings, and behaviors increases synaptic connectivity, strengthens neural networks, and creates new neurons through learning. In other words, practicing a positive habit can predispose our thoughts to be more affirmative. The key to developing these positive habits? Mindfulness. According to researchers at the Greater Good Science Center, a project at the University of California, Berkeley, mindfulness has two core components: maintaining an awareness of our immediate thoughts, feelings, and surroundings; and accepting these thoughts and feelings without judging them. McGarvey explains it as “single-tasking,” or approaching any situation with your undivided attention and keeping that attention on the present moment. By approaching your work with mindfulness, you decrease the amount of energy you spend worrying about the past or the future, and you increase the amount of attention you give to present and positive experiences. But because stress and worrying can be so engrained, McGarvey explains, you need to practice (and keep practicing) the skills and habits you need to keep your attention on the present. Several times a day, take a short break from whatever you’re doing — step away from the computer, put down your phone, close your book — and look at something different. Savor the feeling of calm for a minute or two. Practice looking for small moments of beauty or kindness throughout your day: raindrops moving across your window, a moment of warmth in the sunshine, an amiable exchange with a stranger. Focusing on the positive will strengthen your ability to turn your attention away from worries. Exercise. Calming meditations, yoga, and tai chi can all activate the parasympathetic nervous system and evoke a physically relaxed state. Making any of these practices into a habit can make it easier for your body to relax after a stressful event. Remember that habits can be hard to form, and change takes time. Focusing on the positive means going against your brain’s automatic response systems. Try to be persistent with your mindfulness practices, but don’t beat yourself up if you slip and find yourself getting stressed. Be gentle with yourself. Tips on how educators can build mindfulness. Advice on how to stay mindful at holidays or other stressful time of year.